We’ve explored France, Italy, Spain, Switzerland & The United Kingdom and jotted down our favorite food-finds along the way. Some are Michelin Starred establishments and some are World’s 50 Best, but many are off the beaten path. The breadth of this list ranges from tasting menus to gelato cafe’s to bars. We’ve only included the places we thoroughly enjoyed and would go back for also known as the places we’d feel confident sending you! We are fans not critics of restaurants. Sure, we have bad experiences from time to time, but you’ll never hear us say that publicly, we just won’t post about it. Our feed and blog focuses on the positive things that are working, not rants of what isn’t – the world has enough complainers! It doesn’t make sense to waste our time or yours talking about things we didn’t like. In situations where a restaurant had an off night, out of respect for them and their life’s work, we do not shame them on social media. We show our disdain by simply not talking about our experience at all and if the experience was horrendous, we take it up directly with the establishment & chef. We feel this is the proper and classiest approach. If we receive a private message asking for specific feedback, we will always be honest. 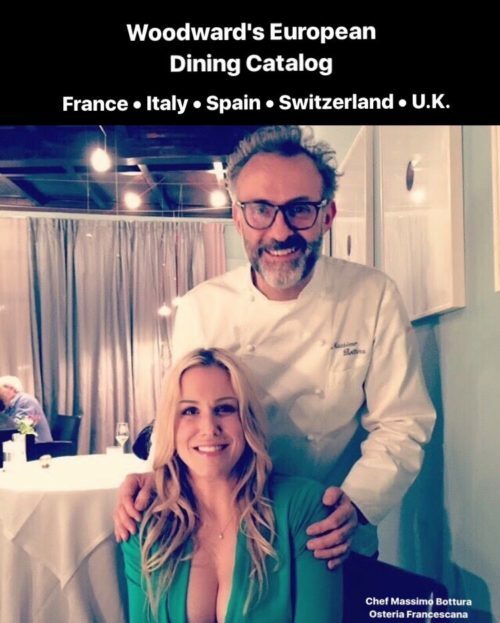 That being said, all of our happiest occasions are captured in each of the continent specific ‘Woodward Dining Catalogs.’ We’ve eaten at far more places than you’ll see listed. At the end of this memoir are several links to our catalogs in other parts of the world! Central & South America click here. Comprehensive North American (USA & Canada) Catalog, click here. As we continue to explore Europe, we will periodically update this catalog. How did you manage to get a reservation at Osteria Francescana? Was it as good as all the hype? What is a Tastemaker? How did you become that? Cool blog.